My Linux Ubuntu desk top computer. I abandoned Apple Macs last year for the delights of updating the Libre Office word processing software (just as good as Word) free. And the machine won’t need upgrading like Apples either. And it was much cheaper. It’s very fast. On the first shelf facing outwards, the four books that Ad Hoc Fiction published in 2017. 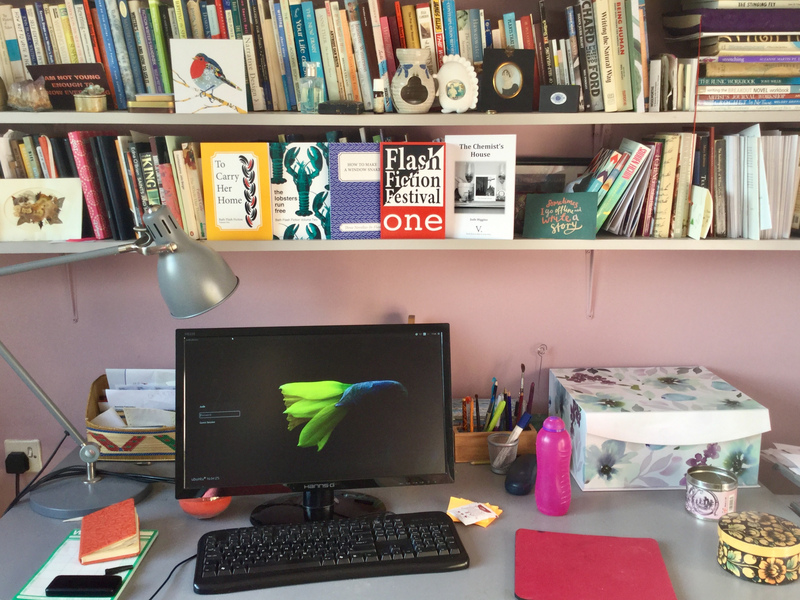 Ad Hoc fiction does all the background competition administration and web development work for Bath Flash Fiction, as well as Bath Short Story Award. I’m so excited they are now a small press, and published To Carry Her Home, Bath Flash Fiction Volume One early last February, How to Make a Window Snake, the collection of winning novellas-in-flash in June. And Bath Flash Fiction Volume 2, The Lobsters Run Free in December 2017 along with Flash Fiction Festival, One. And there’s more to come next year. Individual collections as well as the 2018 anthologies. My debut pamphlet ‘The Chemist’s House is up there on that shelf too. One of the highlights of last year was being published by V. Press. The scented candle in the pink tin. Rose. The re-useable water bottle. Going to really make big efforts to reduce buying plastic this year. The extremely cheap Nokia phone I use for infrequent calls and texts. I use an iPad for everything else and am resisting a smart phone. The little orange book rests on a note pad which is supposed to detail what I eat every day. But I haven’t filled it in for several months. The junk box. Full of junk. But pretty on the outside. That little flowery box contains some jewellry. the hedgehog frame containing a tiny picture of my parents, looking young. Too small to see. A few book titles just about visible. ‘Sudden Fiction‘, my first intro to flash fiction. A Richard Ford novel, which is in the wrong place there. Should be on the alphabetical novel shelves. It’s next to Writing the Natural Way, one of the first books on writing I bought, years ago. 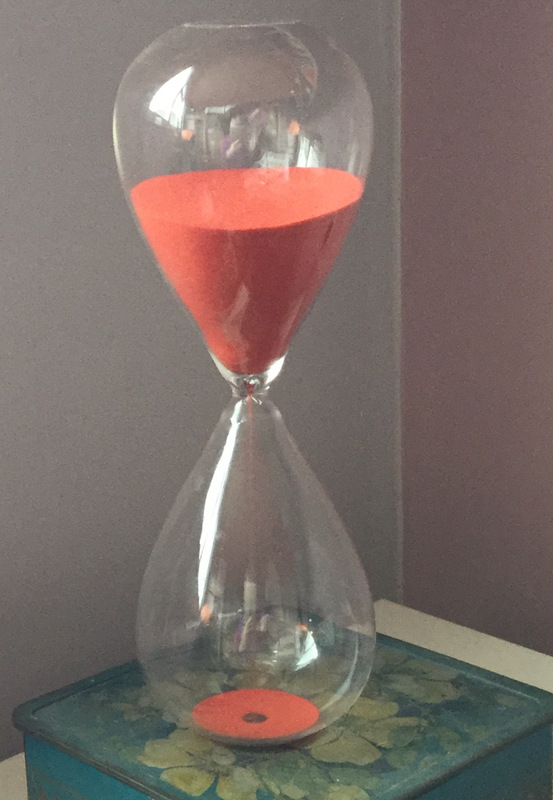 My hour glass has fallen behind the computer. You can just see a flash of glass and orange sand peeking out. I do plan to write fiction for at least 60 mins several times a week this year. And to make that a priority instead of the numerous other writing activities I am involved with. So I have given the hour-glass its own picture. If it’s visible, I won’t forget. And I want to submit more this year.